JAZZMAN Lou Donaldson at the Newark Museum last month. THE alto saxophonist Lou Donaldson burst on the jazz scene around 1950 with a bebop style that many listeners likened to Charlie Parker’s. A few years later, he adopted a more basic blues approach that evolved into a popular, and profitable, jazz corollary to the work of soul singers like James Brown.Today, at 82, he remains a leading exponent of this soul-jazz approach. But even at its bluesiest, his playing remains informed by bebop. If the economics allowed it, he said, he would delve more into the bop canon. “I’d like to be playing that every night,” he said. “But unfortunately, that’s not the case today.” At most of his outdoor concerts, he said, the audience demands his soul-jazz favorites — and he delivers. Those favorites, he said, will figure prominently on Aug. 18, when he brings his quartet to Mount Vernon for a free set, produced by Jazz Forum Arts and Jazzmobile, in City Hall Plaza. The Mount Vernon performance, he said, will closely resemble the quartet’s lunchtime show for more than 800 people late last month in the garden of the Newark Museum. It will be heavy on the kind of 12-bar blues and free-flowing patter to which Mr. Donaldson’s fans have become accustomed. By the time Mr. Donaldson serves up what he calls “sufferin’ music” — down-home blues like “Whiskey Drinkin’ Woman” and “It Was a Dream” — the audience is usually under his sway. On these tunes, he tends to sing lustily but play sparingly, leaving the improvisational heavy lifting to the guitarist Randy Johnston, his sideman off and on for nearly 12 years. During a typical afternoon concert, Mr. Donaldson will also yield center stage to Akiko Tsuruga on the Hammond B3 organ and Fukushi Tainaka on the drums. But at all times, Mr. Donaldson looms large, liberally sprinkling musical quotations throughout his performances. Introducing the Ray Noble classic “Cherokee,” his standard closer, to the Newark audience, he joked that Parker’s 1940s version had “discouraged a lot of people from playing the saxophone.” He then launched into a blisteringly up-tempo rendition, complete with unaccompanied choruses that recalled the sustained brilliance of Parker at his most daring. For all his loquaciousness onstage, Mr. Donaldson cuts a modest figure offstage. The scene after the concert last month — a small crowd of autograph-seekers and friends like the poet Amiri Baraka — was typical of Mr. Donaldson’s encounters all over the New York City area. In Mount Vernon, he will count among his longtime friends and admirers Robin Bell-Stevens, the president and chief executive officer of Jazzmobile, who is a local resident, and Mark Morganelli, the executive director of Jazz Forum Arts. Both organizations have cut the number of shows they are presenting amid the economic downturn. But the executives said they remained awed by Mr. Donaldson’s longevity and lucidity, and that booking him for the Mount Vernon date, Jazzmobile’s only show outside New York City this summer, was an easy decision. “He’s a living legend,” Mr. Morganelli said. 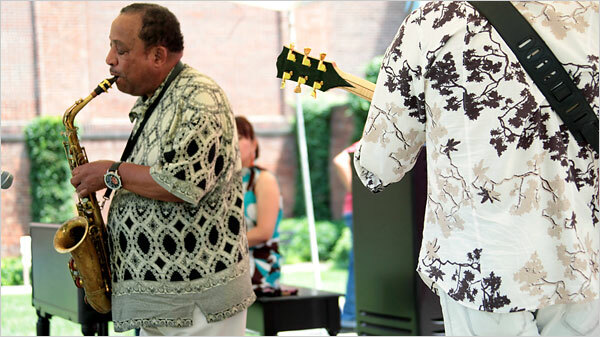 The Lou Donaldson Quartet will perform on Aug. 18, at 7 p.m. at City Hall Plaza, Mount Vernon. Free. Information: jazzforumarts.org or (914) 674-2005. More Articles in New York Region » A version of this article appeared in print on August 9, 2009, on page WE10 of the New York edition.